PlusGard is an additional, advanced guardrail that provides fall prevention for the scaffolder throughout assembly and dismantling of a scaffold. 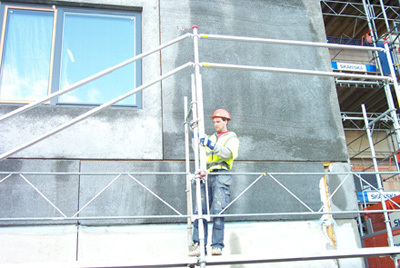 From the ground up the scaffolder using PlusGard is no longer exposed to the danger of falling.The scaffolder can now enjoy the same protection as the user for whom he builds without the need of harnesses. The work can now be carried out in a more ergonomic way with higher productivity. If you want us to contact you or have questions or comments you can contact us filling in the following form. Version: 2.0 © Copyright 2012 PlusEight International AB, Sweden.